Seeing Bluebirds in your backyard? Bluebirds will be pairing up and scouting for nesting sites soon! 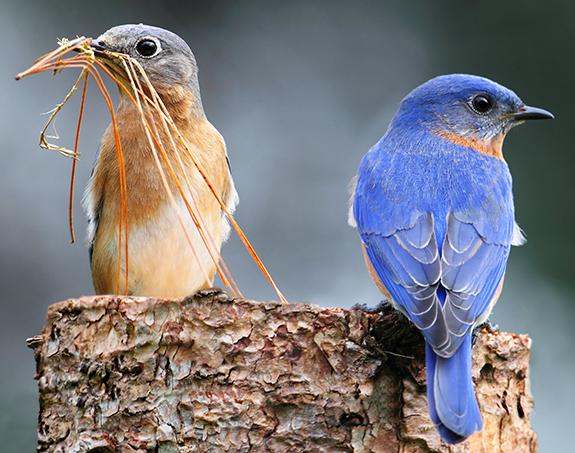 Eastern Bluebirds begin defining and defending their nesting territories earlier than other species — generally, starting the end of February, early March. Want Bluebirds to Choose Your Nest Box? Start with a clean, Sparrow-resistant box! As a good backyard bird host, you already know this: You need to start with a clean box and always clear between broods and after the last one of the season. If you haven’t already, go do it NOW!!! Bluebirds normally have 2-3 broods each season, so you’ll need to clear out the whole nest after each brood fledges. A clean box will encourage re-nesting in the same location! Watch for increased activity and lots of chirping, then sudden quiet! That’s a good indication that the fledglings have left home and you need to get ready for the next brood. Sparrow-resistant boxes are critical to secure nesting Bluebirds from their main threat: The House Sparrow! We recommend Slot Boxes or the Gilbertson Nest Box as the most effective for deterring House Sparrows and dedicated monitoring is important. For more info ask us at the store or see our web page “House Sparrows: Deadly Foreign Invaders“. Position boxes in open areas at least a hundred yards apart facing the openness of a yard, meadow or field. Mount bird houses on poles with snake baffles. Even if you don’t regularly see snakes sneaking around in your yard. Offer our freeze-dried meal worms in a separate feeder, away from all your other feeders for an added incentive! Although Eastern Bluebirds’ actual egg laying and incubation begins later in the spring, the box a Bluebird pair chooses now will give them shelter from weather and predators. If there aren’t any Bluebirds scouting your backyard, there are many more ways you can help with their resurgence in Maryland! (See our blog post about where it all started.) Join our local Maryland Bluebird Society . Debi & Mike and the Staff at The Backyard Naturalist are always happy to answer any questions to help enhance your Bluebird experience. Debi has been a Bluebird Mentor for Montgomery County for 30 years! Share your Bluebird sightings and photos on our Facebook page! Keep us posted!